Disclaimer: I was provided products to review for this post. I was not otherwise compensated. All opinions are my own, honest and unbiased opinions. Your views may differ, thank you! Mom's Gone Bronson is not responsible for prize fulfillment. 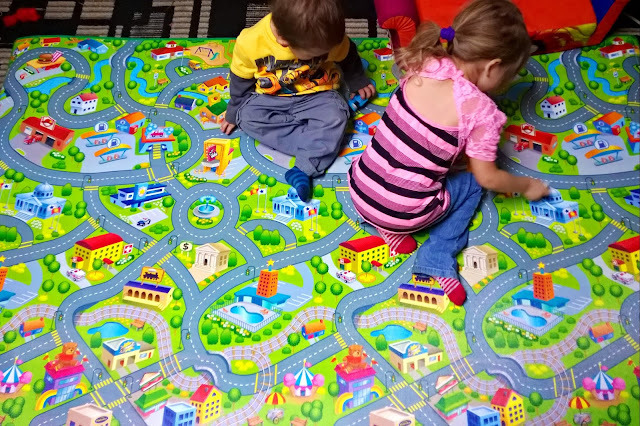 PLASMART SMART MAT REVIEW AND GIVEAWAY! 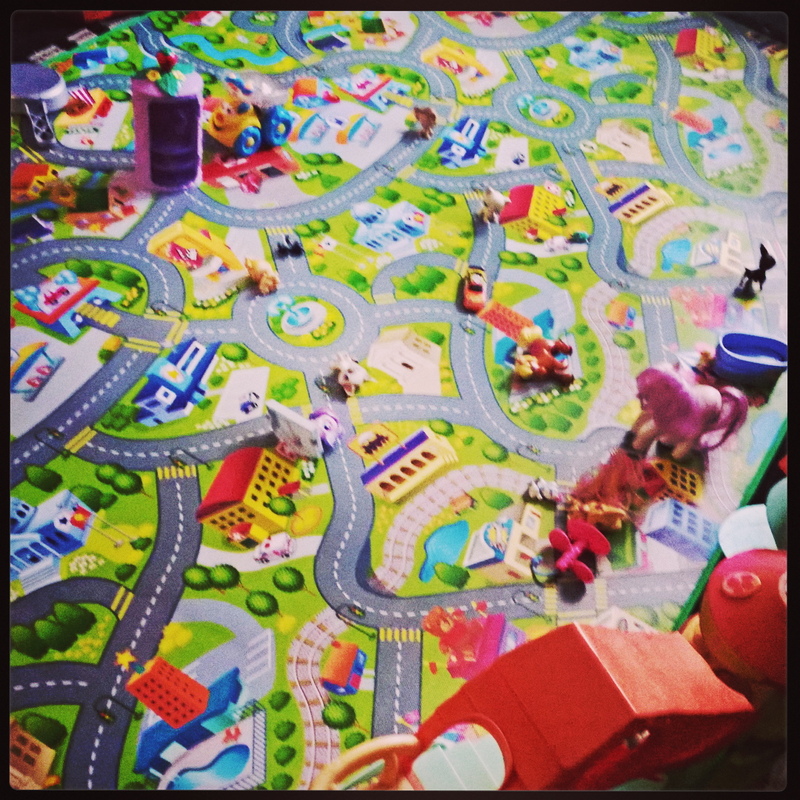 PlaSmart is one of my favorite toy destinations, with simple and smart toys that are also fun and entertaining for all the family! We had the chance to play with the PlaSmart Inc. Smart Mat, which is HUGE at 78"x46", is durable and easy to clean, with a bright and colorful selection of scenery for children to be able to use their imagination with their own toys, cars and more on top! My children took to this mat straight away and being as it is so big, there is plenty of room for them both to set up their toys and play! My daughter likes to get her doll houses and put them around the mat to make a giant city, while my son likes to drive around the roads with his cars and trucks, while visiting around the houses that my daughter's toys are set up at! There is a great deal of emphasis on imaginative play in our household and I encourage it whole-heartedly and the fact that the kids are happy to have the T.V off and play with this mat for hours on end is a good testament to how much fun they can make themselves when they have something to bounce their creativity and ideas off of, which is why this Smart Mat is such a great addition to their play! The mat is made of coated EVA foam, which is easy to wipe clean if there are any accidental messes made, and it is soft enough to roll up for storing away! The only thing I would love to see added to this mat is a small clip to keep it rolled for storage, but other than that it is perfect and I throw on a chip-clip or large elastic band to keep it rolled up when stored! I am thrilled with the mat, not only because it is durable and easy for me to clean, but because it is bright, colorful and fun for all ages and visiting friends love to play every time they come on over! The PlaSmart Smart Mat makes our Holiday Gift List with ease and couldn't be a more perfect fit for households who love to play and learn with imagination and a little freestyle! Perfect for all ages, no moving parts but lots of stimulation! Find PlaSmart on Twitter, Facebook and Youtube as well as the PlaSmart Website, for more information and up-to-date news and even more fun adventures! BUT WAIT! There is MORE! - GIVEAWAY!! The nice folk over at PlaSmart would like to give away a SMART MAT to ONE of our lucky readers and all you have to do to be in with a chance of winning is to reside in the U.S.A, be over 18 or have a parents permission to enter, sign up with your valid email address so we can contact you if you win, and enter via the rafflecopter below! It is THAT easy! This giveaway will end at midnight on December 15th 2015 and the winner will be notified within 24 hours of giveaway end! Prizes must be claimed within 48 hours or else the prize becomes forfeit and we pick a new winner until a winner is confirmed! That's it! Head on down to the rafflecopter, below and enter to win! When you are done, you can also enter the GIVEAWAY HOP. 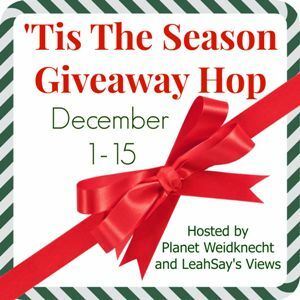 located under the rafflecopter, which is brought to you by Planet Weidknecht and LeahSay’s Views, to whom we say THANK YOU! My favorite is the Drop Shot game! I like the Original Plasma Car. My kids would love the Plasma car for sure! The Plasma Car is my favorite!! I think my kids would also love the Fun Slides Carpet skates! lol! My favorite is the original Plasmacar! My favorite is the plasma bike. I really like the smart mat, it's so big,my kids would really enjoy it. Thanks for the chance to win it. I'd love a plasmacar, my kids rode one at my sister's and loved it! The carpet skates would be so much fun! The Plasmacars are the best because kids from 1 to 101 can ride them. I am really interested in the OgoSport games, however, and look forward to trying them. My favorite is the PlasmaCar. My favorite is the plasmabike, looks great. I really like the Magic Canvas. Thanks. my favorite and my family favorite is the Original Doodle Art! my brothers family been working off and on one of them for the last 20 years or more.with different parts done by different people. My grandson would love the Plasma Bike. I like the Scribble Down activity packs!